Let’s say we just had a new house constructed in 1962; what would the kitchen look like? My dad was building homes at that time and comparing what I remember with photos from advertisements and internet sources, it appears that his homes were fairly typical. His homes were small suburban ranches, generally with three bedrooms and a dining area attached to the kitchen instead of a separate, formal dining room. So let’s hop in our Roadtrip-'62 ™ Chevy Impala and visit one of these homes, to see the kitchen. Home built by the author’s father in 1962 in Saginaw, Michigan area. Immediately after World War II, the country experienced a home building boom that went on for a couple of decades. There was a pent-up demand since the 1930s Great Depression, and returning military personnel had money which fueled the buying spree. Homes began at less than 1,000 square feet, but by 1962 had moved upscale to around 1400 square feet. Kitchens had started out with white steel cabinets, moved through a pastel steel cabinet phase, and by 1962 had begun to move to wood cabinets. Steel was cheap after the war because it was no longer in demand for military vehicles, ships, airplanes, munitions, etc., so it found new markets in things like kitchen cabinets. During the 1950s there were almost 90 manufacturers of steel cabinets! But while steel might last forever, it was subject to denting, rusting, and it showed fingerprints. Additionally, as homes became a bit larger, family rooms began to be built adjacent to kitchen areas and people wanted the kitchens to look more like they had furniture in them. I once owned a home with GE steel kitchen cabinets. It was built in 1958 and the cabinet doors were faced with plywood, giving evidence of the trend to wood. 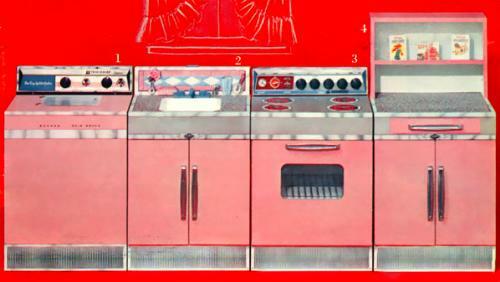 By 1962, you could still find new pastel steel cabinets, but other bolder colors were offered in an effort to be unique. Wood had its own range of colors, and 1962 kitchens are seen in all shades from light blonde to dark walnut. Wood cabinets eventually won the battle and that’s mostly what we see today: only 2-3 steel cabinet manufacturers remain. I’m fairly certain that my dad used wooden cabinets. Typical kitchen from 1962 National Plan Service Kitchen Ideas brochure. Typical kitchens of the time appear to have used Formica countertops and vinyl or linoleum flooring. Formica is a laminated composite material consisting of many layers of kraft paper, phenolic resin to bind them together, a decorative paper on top, and melamine thermosetting resin to cover and protect it all from damage. The material was invented in 1912 at the Westinghouse Electric Corporation in a search for a less expensive electrical insulating material to replace mica. In 1927, Formica Insulation Company obtained a patent on an opaque barrier sheet for the top layer that allowed the use of printing to make a wood-grained or marble-look product, and Formica became a decorative interior product. In 1938 melamine thermosetting resin was developed by American Cyanamid Company, which was substituted for the top layer of the laminate. It resisted heat, abrasion and moisture better than the phenolic or urea resins then used. Soon after, the Formica Corporation was buying the entire output of melamine from American Cyanamid! During the post-war housing boom, the company created many designs that are still iconic of the 1950s, such as Brooks Stevens’ “Skylark” pattern, Raymond Loewy Associates’ “Sunrise” line, Prince Sigaard Bernadotte’s “VirrVarr” pattern, and the “Boomerang” pattern. Other companies make a similar product, including Wilsonart, Pionite, and Arborite. Wilsonart was founded by Ralph Wilson Sr. in 1956 and at the time, there were 16 competitors in the decorative laminate industry. Formica held a 65% market share, but that left plenty of room for competitors. Arborite is a more recent entry that is unique in using 22% post-consumer waste as recycled content, primarily in the paper layers. It does not contain any formaldehyde and is certified by Greenguard and NSF. 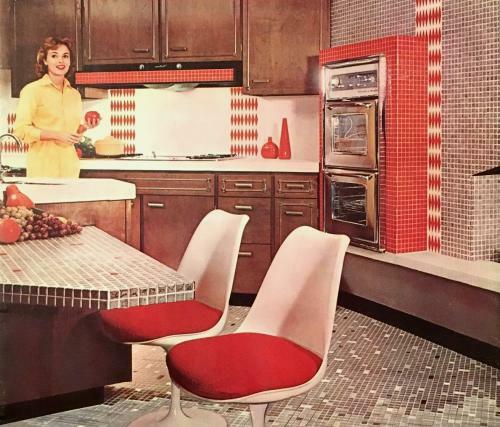 High-end designer kitchen from 1962 National Plan Service Kitchen Ideas brochure. Kitchen floors of the time were mostly vinyl sheet or tiles. I remember laying the tiles because the glue smelled terrible! Hardwood floors were often used in the remainder of the house, but they became easily water stained in a kitchen, and were avoided. In higher end houses, brick, tile, and stone were used more, especially on walls as accents. Those homes would also have used stone for countertops, as has become very common in recent years. Note the photo above which has tile on nearly every surface! As with the typical kitchen in the other photo, cabinets are strictly wood, with a hint of colonial styling that was becoming popular. Gone are the pastel colored steel cabinets of just a few years ago, though the appliance companies were still offering pastel ovens, refrigerators, and dishwashers. And the wall oven and sculpted chairs complete the 1962 styling. Part of 1962 magazine ad for Frigidaire Dishmobile diswasher; note that it still comes in pink. Lighting also helped set the mood of a kitchen in 1962, and there was a lot to choose from. Chandeliers ranged from atomic or starburst styles of the 1950s that had not yet gone away, to Early American Colonial, to cone-shaped down lights, to novelty themes like wagon wheels and anchors. Fluorescent lights were available in both concentric circles or hidden in soffits. 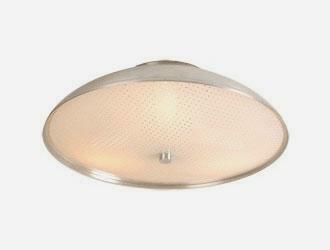 You could also find bubble lights, spotlights (either recessed or hanging), and ceiling mounted glass fixtures. My dad usually went with simple circular ceiling mounted glass fixtures. These cut construction costs and gave home buyers the option of installing any special lighting of their own taste after they bought the house. As always, there were innovations that showed up in kitchens. 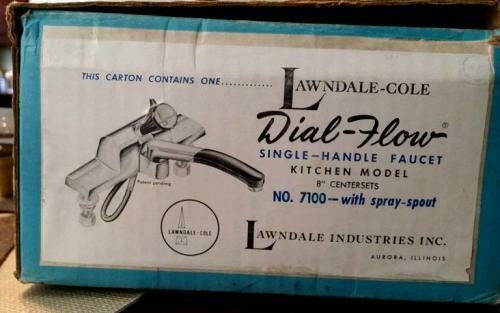 Lawndale-Cole came out with a Dial-Flow Kitchen Faucet in 1962; one of the first single handle kitchen faucets. This faucet included another innovation, the front part of the spout pulled out to become a sprayer. This is now a very popular design on kitchen faucets. Henry Uihlein, Sr. founded the U-Line Corporation in 1962 and the company developed and patented the first undercounter residential ice maker. The company is still in business, having added other home refrigeration products including small freezers, drawer model refrigerators, and wine cooling systems. All products are still built in Milwaukee, Wisconsin. Microwave ovens were brand new in homes for 1962. Raytheon Corporation had sold the first, their Radarange, in 1947. It was the first commercially available microwave oven. But it was both to large and too costly for home use, being 5 feet tall, weighing about 750 pounds, and using about three times as much electricity as today's microwave ovens. Oh, and it needed plumbing, because it was water-cooled! In 1961, Sharp developed Japan's first microwave oven and the following year began selling them to consumers. A US-built microwave for home use wasn’t sold until 1967, when Amana released one. And finally, a peak at toy kitchens of 1962. As you can see below, the pink kitchen is a bit behind the trend of grown-up kitchens: there’s no wood here. The set is noted as easy to assemble corrugated fiberboard (cardboard). Kitchen sets have remained popular toys right up to the present. By the 1970s, when we got my daughter a toy kitchen, it was steel construction. In the late 1980s, plastic became common and if you see a toy kitchen today, it’s likely plastic. They also generally look more cartoony and much less realistic than that 1962 toy. Of course, if you didn’t have room in the house for a toy kitchen, you could get your child Miss Cookie's Kitchen, a Colorforms set made in 1962. These stick-on plastic pieces allowed the kids to pretend to cook and serve and came complete with accessories such as mixing bowls, spoons, and butter, milk, and eggs. Let’s grab some cookies from the kitchen and get Roadtrip-'62 ™ back out on the road for next time! Toy kitchen from 1962 Spiegel Christmas Catalog.